In my last article, Oracle Multi-tenant Application Containers Part-III, we learnt about data sharing among containers in an application container by means of metadata-linked objects, data-linked objects, and extended data-linked objects. We already know that in an application container, the data in metadata-linked objects is specific to various application PDBs (pluggable databases) within the container. In order to view data in a metadata-linked table across various application PDBs, we can either connect to each PDB individually or create corresponding database links. When it is required to aggregate data across multiple PDBs from a metadata-linked table that exists in the CDB root and multiple PDBs, the CONTAINERS clause introduced in Oracle database 12.1.0.2 comes in handy. When such a table is queried in the CDB root using the CONTAINERS clause, the table is accessed in the CDB root and in each of the opened PDBs, and a UNION ALL of the rows from the table is returned. In Oracle Database 12.2.0.1, this concept has been extended to work in an application container. When a metadata-linked table is queried using the CONTAINERS clause in the application root, a UNION ALL of the table rows from the application root and all the opened application PDBs is returned. Thus, by leveraging the CONTAINERS clause, the user-created data can be aggregated across many application PDBs from one single place; i.e., the application root. If we need to retrieve data from a subset of the PDBs, we can include a filter on CON_ID or CON$NAME in the WHERE clause. However, using the CONTAINERS clause like this has a drawback. When rows of tables are horizontally partitioned across PDBs based on a user-defined column (say region), queries requiring access to specific partition(s) of data need to access all the partitions even though rows are retrieved from a subset of partitions only. This drawback can be overcome by using the CONTAINER Map, which is a single-column map table partitioned by list, hash, or range, created in the application root. It defines the column based on which data is partitioned across application PDBs. It indicates how rows in metadata-linked tables are partitioned across application PDBs. When a query using a CONTAINERS clause is received at the application root, the database server, based on the partitioning key passed to the query, uses the container map to route the query to the relevant application PDBs. This effectively causes the pruning away of other partitions, and therefore the application PDBs, thereby improving the performance of the query. We can further set the CONTAINERS_DEFAULT attribute on any metadata-linked table so that queries issued in the application root use the CONTAINERS() clause by default for the database object. To specify a filter on the user-defined column (region) based on which data is partitioned. Enabling of the CONTAINERS_DEFAULT attribute for a table so that queries issued against it in the application root use the CONTAINERS() clause by default. Here, we have an Oracle database 12.2.0.1 CDB called orclcdb as shown. Within this CDB, we have created an application container sales_app for the sales application of an organization. Also we have four application PDBs North_app_pdb, South_app_pdb, East_app_pdb and West_app_pdb, which are databases supporting the sales_app application for the various regional offices of the organization. While sharing the structure of the metadata-linked customers table stored in the application root sales_app_root, each application PDB can store region-specific customer data in the table. 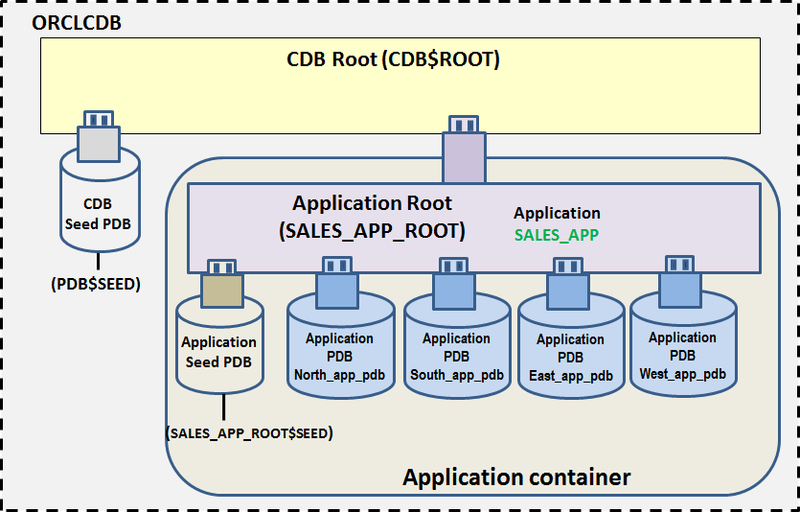 Let us first connect to the CDB orclcdb and verify that there is one application container root sales_app_root in this CDB. Connect to application root sales_app_root and note that there are four application PDBs (north_app_pdb, east_app_pdb, west_app_pdb, south_app_pdb) and one seed PDB (sales_app_root$seed) associated with it. Besides an implicit application, another application sales_app is currently installed in this container. All the application PDBs and the seed PDB are synced with application sales_app version 1.0. Let us check the common objects in application sales_app. Presently, there is a metadata-linked common application table sales_app_user.customers with the structure as shown. Let us connect to each of the application PDBs to view the records in the table sales_app_user.customers. Note that the customer data is partitioned across the application PDBs based on the column CUST_ZONE. Currently, we have four records in the table in each of the application PDBs, as shown. Instead of connecting to each application PDB to view records, now we will use the CONTAINERS clause to aggregate all rows from the four application PDBs while connected to the application root sales_app_root. We can also specify a filter on the column CON_ID to get data from a subset of application PDBs. However, if it is desired to fetch data from partitions corresponding to specific values in the partitioning column, it is advisable to specify a filter on the partitioning column; e.g., where CUST_ZONE in (‘S’, ‘W’) rather than CON_ID because a change in CON_ID may require application changes. In Oracle Database 12.2, CONTAINERS() adds two more implicit columns, CON$NAME and CDB$NAME. These are hidden columns and thus have to be explicitly referenced if their values are to be displayed. Consequently, we can query data from an application PDB by specifying its name also. Let us retrieve customer records for the South zone only and check the corresponding execution plan. As can be seen, although the rows of the customers table are horizontally partitioned across PDBs based on cust_zone column and only one PDB (south_app_pdb) needs to be accessed to retrieve the desired rows, all the partitions are being accessed. To overcome this drawback, we can create a container map table which will inform the database server about the partitioning strategy so that a query would be appropriately routed to the relevant application PDB(s). The container map table is a single-column table created in the application root. The column name should match the column being used for partitioning the data in the metadata-linked table being queried. The map table is partitioned by list, hash, or range on its only column. The names of the partitions of the map table should match the names of the corresponding application PDBs in the container. Here, we will create a list-partitioned map table named sales_app_user.map_table that creates a partition for each cust_zone, and zone code (‘E’, ‘W’, ‘N’, ‘S’) is used to determine the zone. The partitions are named east_app_pdb, west_app_pdb, north_app_pdb and south_app_pdb corresponding to the names of the application PDBs. Next, while connected to the application root, we will set the database property container_map for the application container to the name of map table. Let us enable the sales_app_user.customers table to collaborate with the container map table as part of application upgrade. This results in setting of the CONTAINER_MAP attribute on the table. Synchronize all the application PDBs with the upgraded application. Now, if we issue a containers query to retrieve customer records for a subset of zones and check the corresponding execution plan, it can be seen that the query is routed to only those PDB(s) which contain(s) the required data. It is worth mentioning here that when the container map is in use, the rows in a metadata-linked table inserted in the application root, if any, are not displayed. We can further upgrade our application to enable the table sales_app_user.customers to be used without the CONTAINERS() clause so that a query against the table will use the CONTAINERS() clause by default even when the CONTAINERS clause is not explicitly specified. This will result in setting the CONTAINERS_DEFAULT attribute on the table. Let us synchronize all the application PDBs with the upgraded application. Now, if we issue a query against the sales_app_user.customers table without a containers clause, CONTAINER_MAP and CONTAINERS_DEFAULT are used together. Whereas CONTAINER_DEFAULT causes the query to be automatically transformed into a containers query, CONTAINER_MAP causes the pruning of partitions and therefore the application PDBs, based on the key that is passed to the query. Note that it is not mandatory to use CONTAINERS_DEFAULT with CONTAINER_MAP. Container maps can be created in the CDB root, but the best practice is to create them in application roots. One application container can have one container map only. Data loaded into the PDBs’ tables must be consistent with the partitions defined in the map object. When an application PDB that is referenced in a map object is unplugged, renamed, or dropped, the map object must be updated manually to account for such changes. By leveraging the CONTAINERS clause, user-created data across many application PDBs can be aggregated from one single place; i.e., the application root. When the CONTAINERS clause is used without a container map, queries requiring access to specific partitions of data need to access all the partitions even though rows are retrieved from a subset of partitions only. Use of CONTAINER MAP with a query containing a containers clause causes the pruning away of irrelevant partitions when rows are retrieved from a subset of partitions only. Enabling of the CONTAINERS_DEFAULT attribute for a table causes queries issued against it in the application root to use the CONTAINERS() clause by default.